In 1941, Lyndon Baines Johnson ran for U.S. Senate. Franklin D. Roosevelt made a speech on the eve of the election criticizing LBJ’s opponent, Wilbert Lee O’Daniel, nevertheless, LBJ lost by 1,311 votes. LBJ alleged voter fraud. In 1948, LBJ ran for Senate again. On election night, Sept. 2, 1948, in the Democrat Primary runoff against former Texas Governor Coke Stevenson, it appeared LBJ lost. Then, mysteriously, a box of uncounted ballots was “discovered” in the south Texas town of Alice in Jim Wells County, Precinct 13. Confusion reigned in Texas and by the end of the week, LBJ won by 87 votes. Both sides accused the other of voter fraud. The FBI, Postal Department and other agencies investigated. Piecing together the details, the story emerged alleging that during the tabulation period, LBJ’s campaign manager, John B. Connally, traveled to Alice, Texas. With access granted by wealthy “political boss” of Duval County, George Parr, who later committed suicide, John Connally was present when the ballots were recounted and the returns amended. When the dust settled, the new totals showed 202 additional voters, some of whom were deceased and buried in the local cemetery or were absent from the county on election day. These voters “lined up” in alphabetical order at the last minute, signed in the same blue ink in the same handwriting and all cast their ballots for LBJ. “The disclosure was made by Luis Salas, who was the election judge for Jim Well’s County’s Box 13, which produced just enough votes in the 1948 Texas Democratic primary runoff to give Mr. Johnson the party’s nomination for the United States Senate … ‘Johnson did not win that election – it was stolen for him and I know exactly how it was done,’ said Mr. Salas, now a lean, white-haired 76 year old … George B. Parr, the South Texas political leader whom Mr. Salas served for a decade, shot and killed himself in April of 1975. Mr. Johnson is dead and so is his opponent … Mr. Salas said he decided to break his silence in quest for ‘peace of mind’ … ‘I was just going along with my party’ … He said Mr. Parr ordered that 200-odd votes be added to Mr. Johnson’s total from Box 13. The Democrat Central Committee was deadlocked 28 to 28 on whether to certify the questionable election results, so Connally persuaded Frank W. Mayborn, publisher of the Temple Daily Telegram, to cut short a business trip in Nashville, Tennessee, and return to cast the deciding Committee vote to certify the election results. Coke Stevenson took LBJ to court and on Sept., 24, 1948, Judge T. Whitfield Davidson ordered LBJ’s name removed from the general election ballot. 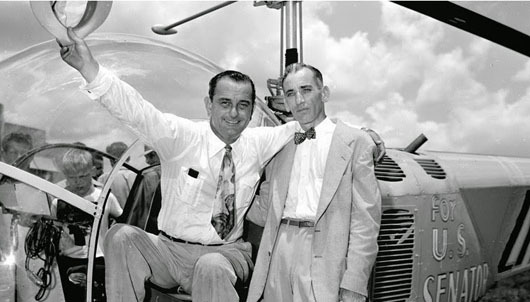 LBJ turned to Washington attorney and former FDR appointee Abe Fortas. Abe Fortas persuaded Supreme Court Justice Hugo Black, who was also appointed by FDR, to intervene. On Sept. 28, 1948, Justice Black overturned the lower court ruling, letting the decision in the Johnson-Stevenson race rest with the Texas Democrat Central Committee. In return for his favor, Abe Fortas was nominated by President Lyndon Johnson in 1965 to be a Justice on the U.S. Supreme Court. During LBJ’s term as President, many records of LBJ’s contested race disappeared. In 1966, Abe Fortas accepted money from a Wall Street financier investigated for securities violations. Abe Fortas resigned in 1969.